Photo: LeRoy Robbins In 1948 the gay community as we know it did not exist. Homosexual was a word used only to describe those who were considered sick heterosexuals. Yet in that same year, one man had the visionary idea that homosexuals were a "cultural minority" that could be organized to create a community and fight for their human rights. Sixty years later that vision developed into a worldwide civil rights movement and inspired the creation of lesbian, gay and transgender communities on every continent. 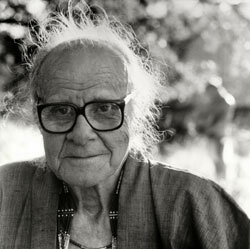 The man who had that exceptional vision was Harry Hay. 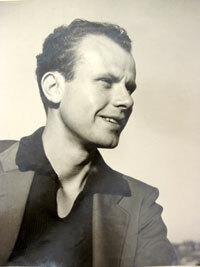 An actor, Communist labor organizer, musicologist, gay theoretician and political activist, Harry Hay left a lasting mark that continues well into the 21st century. He was active in the Los Angeles avant-garde arts movement of the 1930s where he worked as an actor. Hay participated in the San Francisco General Strike of 1934 and fought against Fascism, racism and anti-Semitism in the 1940s. In 1948 he conceived of and helped create the first sustained Gay activist group in America, the Mattachine Society. Throughout the 1950s he conducted research into areas of anthropology, science, history and mythology for evidence of what he termed "my people," the gay community. In the 1970s he worked for and supported Native American struggles and helped to define and bring together the Gay men's spirit group called the Radical Faeries. Hay continued theorizing and organizing his People and supporting social justice for all people right up to his death in 2002. Photo: Mark Thompson In celebration of the centennial of Harry Hay's birth in April 2012, this exhibition explores the life, ideas and contributions of the man who has rightly been called the “founder of the modern gay movement.” Drawing on original papers, ephemera, videos and personal items archived in the Harry Hay Papers, James C. Hormel Gay and Lesbian Center, San Francisco Public Library, the epic story of this compelling and complex civil rights leader is brought to life. The exhibition follows Harry Hays life from his early years through to the founding of the Mattachine Society and onto his later activism and eventual co-founding of the Radical Faeries. Along the way we look at what were the significant events in his life that formed and enabled him to do what no one else had done before. We explore his relationship with his parents, his precocious intellect and his early acceptance and openness about his homosexuality. The exhibition examines his labor activism and involvement with the Communist Party and its People's Songs movement before moving onto the Mattachine Society period and its aftermath. His work as writer and thinker on Gay Consciousness and identity is examined along with his rediscovery by a younger generation of Gay and Lesbian activists in the 1970s. His longings and desires are explored from his earliest sexual contacts and crushes to his early 1960s meeting with inventor, John Burnside, who became Hay's "loving companion" and life partner for the last 40 years of his life. The exhibition investigates their life and activism together, culminating in their co-founding of the Radical Faeries and ending with Hay's death in 2002. All items in this exhibit are drawn from the Harry Hay Papers, James C. Hormel Gay and Lesbian Center, San Francisco Public Library, unless credited elsewhere.